Provide comfort for the family of Susan Ordahl with a meaningful gesture of sympathy. 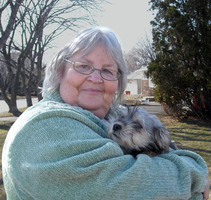 Susan "Suzy" Marie Ordahl, age 60 of Bloomington. Born July 13, 1958 in South Saint Paul, MN; died unexpectedly February 15, 2019 after a long battle with Fibromyalgia and kidney disease. Preceded in death by parents, Joseph and Delores Slater and cousins. Survived by, husband, Dennis; son, Justin (Christa) Ordahl; daughter, Katie (Bryan) Wilkins; grandchildren, Payton, Jayse, baby girl Ordahl on the way, Blake, Keira, and Karmen Wilkins; siblings, Judy Slater (Sandy Terry), Nancy (Bruce) Friedges, Jim Slater, Tim Slater, Maureen (Paul) Cahill and Mary (John) Kaiser; nieces and nephews, A.J. (Karn) Friedges, Corey Friedges, Megan Cahill, Alli Cahill, Mikayla Kaiser and Savannah Slater; many loving family and friends, and dog, Lucy. Suzy enjoyed cross stiching, scrapbooking and doing crafts with her grandchildren. She enjoyed making people laugh and was everyone's biggest cheerleader. Mass of Christian Burial 11:00 am, Wednesday, February 27th at the Church of St. Bonaventure, 901 E. 90th Street, Bloomington. Visitation 5:00-8:00 pm, Tuesday, February 26th at Gill Brothers Funeral Home, 9947 Lyndale Avenue South, Bloomnington with prayer service at 7:30. Visitation also one hour prior to service at church. In honor of Suzy, please wear green - her favorite color. In lieu of flowers memorials preferred. However, if flowers are chosen, please send flowers that are green and white. To plant a memorial tree in honor of Susan Marie "Suzy" Ordahl (Slater), please visit our Heartfelt Sympathies Store. As it grows, may this tree spread Suzy's loving spirit & joyful laughter upon its breezes. With love to you all. A tree planted in loving memory of Sue Ordahl. To her family, I am keeping you close in my thoughts through this difficult time. Suzy, we will always miss you. I think that I shall never see a poem lovely as a tree. Our sweet SuzyQ will always be remembered as full of laughter and fun. The stars will twinkle a little brighter and we can smile thru our tears as we look to the heavens. In loving memory of Suzy Slater Ordahl. We will keep our memories of her smile and laugh close to our hearts.